In previous posts, I've talked about my son, Tony, a student at Eastern Michigan University who is on the high-functioning end of the autism spectrum, and his efforts to write and publish stories for children. Most of his energy has been focused on his Viper Girl series: Viper Girl vs. The Poltergeist Pirate Opossum of Plundering Peril (Book 1) and Viper Girl's Cake and Cookie Catastrophe (Book 2). Book 3 is in the works and is being professionally illustrated. It will probably be out in March or April of 2013. 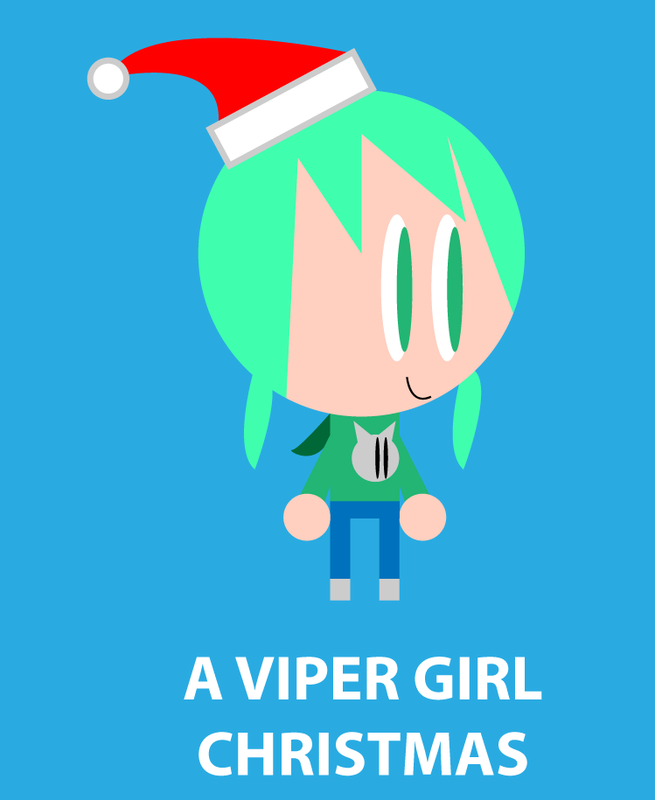 In the spirit of the holidays, Tony put together a very short story: A Viper Girl Christmas. Since, I've talked so much about Tony's work and Viper Girl in this blog, I thought I would share the story here. I hope you enjoy it! Happy Holidays! It was just like any other Christmas. My parents were in Florida continuing their reptile research, and their 10-year old daughter (aka “I”) was home alone, trying to decide on a good Christmas DVD to watch with my pet red fox puppy, Logan. Yeah, believe it or not, this was completely normal for my life at this time of year. On the bright side, there was always one thing I could count on around Christmas: All evil villains, monsters, and lawyers would be too busy with holiday stuff to cause any mayhem for me to clean up. I sipped my peppermint and gingerbread man milkshake as I poured through my DVD collection. Logan flicked his tail back and forth as he flopped on top of my head. I was torn between Santa vs. the Fruitcake of Fate, and Attila the Hun Saves Hanukkah. Both were such classics. I shifted my eyes up toward my fox friend. Logan pawed at his nose. I pulled the two movies off the shelf, and then plopped my pup and myself down in front of the living room TV for some good-old-fashioned, holly-jolly film festivities. A little over an hour later, right when the jolly fat guy was about to unleash the Fruitcake of Fate against Santa, there was a knock on the front door. Now, I know it’s not smart for a little kid to open the door when they’re home alone (especially when that little kid has super-villain enemies), but you have to remember I’m usually home alone because of my neglectful parents. So, I paused my movie and went to see who it was. When I looked through the peep hole, it turned out nobody was there, anyway. A package had just been dropped off. I opened the door and took the package back to Logan in the living room, before checking to see who sent it. Sorry we couldn’t be home for Christmas…again. You know we care about you; it’s just that our work is very important and we need to make a living. All the food and cookbooks we leave you with don’t buy themselves, you know. Anyway, here’s your present for this year. We hope it helps you to forgive us for not being there with you. You should probably dig it out of the box before you keep reading. I set the letter on the floor beside me and reached into the box. I couldn’t believe it! My parents had sent me a Tofu Sprite Battle Plushy! I picked the letter back up and kept reading. It’s the green one. Just like you wanted. Merry Christmas. PS: There are also some chocolate-coated jelly beans in there. I mentioned in my last post that I was running a 20% off sale on all the items in the Christmas Holiday section of my Artifre shop. I've now extended that sale to ALL of the merchandise in my Gossamer Tangles shop on Artfire. All of the prices marked reflect 20% off the regular price. DIY Festive Christmas Tree Earrings - Crocheted with Wire! Why not make your own custom, festive holiday earrings this season? Below is my basic pattern for Christmas Tree earrings, along with some ideas for variations. They are crocheted using wire and glass seed beads (which look like strings of lights on the tree). If you've never crocheted with wire, you'll find that once you get the feel of it, it is almost the same as crocheting with fiber. Just remember, wire is not as forgiving as yarn or thread. If you make a mistake and rip out stitches, it will leave kinks in the wire. Glass seed beads in the color(s) of your choice - size 11 for smaller "lights", size 8 for larger "lights"
Beaded Single Crochet (bsc) - This stitch is worked exactly like a regular single crochet, except that a bead is pulled up close to the stitch before pulling the final loop through to complete the stitch. Insert hook from front to back into the designated stitch . Wrap the yarn over the hook from front to back and draw through to the front of the stitch (2 loops on hook). Pull a bead up against the base of the nearest loop, the bead will be close to and just below the hook. Wrap the yarn over the hook again and draw through both loops. The bead should be part of the completed sc stitch, appearing on the side facing away from you. Single Crochet Two Together (sc next 2 sts tog) - This stitch effectively decreases the number of single crochets in a row. Insert the hook from front to back into the designated stitch. Wrap the yarn over the hook and draw through to the front of the stitch (2 loops on hook). Insert the hook into the next stitch and again wrap the yarn over the hook and draw through to the front of the stitch (3 loops on hook). Wrap the yarn over the hook and pull through all 3 loops to complete the stitch. Single Crochet Three Together (sc next 3 sts tog) - This stitch is worked exactly like the one above, except it is worked over 3 stitches, so you will end up with 4 loops on the hook, after pulling up a loop in each of the 3 stitches. Then wrap the yarn over the hook and pull through all 4 loops, creating a single stitch. Thread 25 beads onto the wire. Using the wire, chain 10, leaving a 6 inch tail at the beginning. Row 1: Sc in the second ch from the hook and in each ch across (9 sc total). Turn. Row 2: Ch 1, bsc in each sc across to end of row (9 bsc total). Turn. Row 3: Ch 1, sc next 2 sts tog, sc in next 5 scs, sc next 2 sts tog (total of 7 stitches). Turn. Row 4: Ch 1, bsc in each sc across to end of row (7 bsc total). Turn. Row 5: Ch 1, sc next 2 sts tog, sc in next 3 scs, sc next 2 sts tog (total of 5 stitches). Turn. Row 6: Ch 1, bsc in each sc across to end of row (5 bsc total). Turn. Row 7: Ch 1, sc next 2 sts tog, sc in next sc, sc next 2 sts tog (total of 3 stitches). Turn. Row 8: Ch 1, bsc in each sc across to end of row (3 bsc total). Turn. Row 9: Ch 1, sc next 3 sts tog (1 stitch total). Turn. Row 10: Ch 1, work 1 bsc in single st of previous row. Fasten off. Leave a 6 inch tail. Now attach the tree to your earring post by threading the wire through the loop on the post until the tree is at the distance you desire from the post (see photos). Thread the wire through the top of the tree and then back through the loop on the post again, pulling again to the desired distance. You can do this a third time if you wish. Essentially, you are sewing the wire through the loop to attach the tree to the post. On the wrong side of the tree, wrap the remaining tail of the wire through the stitches at the top of the tree a few times to secure. Cut the wire close to the tree. Use the needle nose pliers to bend in any end of the wire that is still protruding. Work the wire at the base of the tree (from the beginning chain), into the chain stitches at the base of the tree to secure (just as you would work in a yarn end of using yarn). Cut off the remaining wire and use the pliers to bend in any protruding wire. Want a smaller tree? Begin with a base of 7 sc instead of 9 sc, and change the stitches per row accordingly. Combine the wire with a strand of thin metallic braid (I like Kreinik #4 very fine braid), working with a double strand of wire and thread. Alternate large and small beads, by bead or by row to change the look of the "lights" on the tree. Rather than a ball post, use a star or a tiny angel post. Don't feel like making your own holiday earrings? You can buy various versions of these handmade Christmas Tree earrings, as well as other holiday jewelry, in my Artfire shop. Through Christmas, I've marked down by 20% the prices of all the jewelry in the Christmas Holiday section of my shop. The prices shown reflect the 20% decrease.